In direct test solid phase (i.e., plastic plates) is sensitized with antigen. In another words antigen is coated in solid phase. It is washed to eliminate unattached antigens. The test antibody is added and permitted to react with the antigen and surplus un-reacted antibody is washed off. 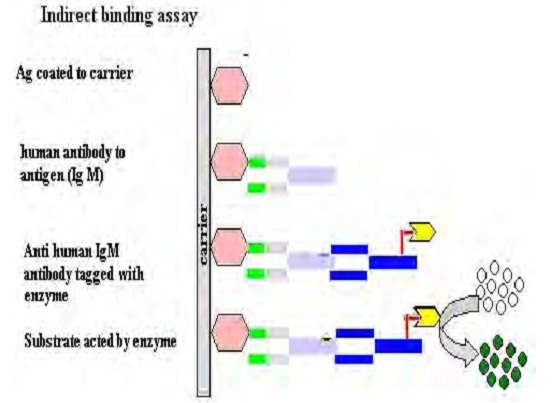 Then a ligand having enzyme which is added that binds to the antibody molecule. The enzyme employed may be either alkaline phosphatase or Horse radish peroxidase. After washing, to eliminate the unattached ligand, the substrate for the enzyme employed is added. When the enzyme is attached via the ligand to antibody molecule, it will react and liberate a chromogenic compound (i.e., colored substance). The ultimate intensity of the color is read with the help of a spectrophotometer. In indirect assay technique an antigen is coated onto the surface of polystyrene wells. The specimen having particular immunoglobulin for the suspected antigen is added followed by the enzyme labeled particular immunoglobulin (i.e., conjugate). In a positive condition, an invisible antibody-antigen complex is made. The complex is made visible by the addition of a substrate that the enzyme in the conjugate modifies to generate a color change. This reaction can be viewed by the naked eye or measured by electronic means like spectrophotometer. In indirect technique the antibody to immunoglobulin is tagged with enzyme and not to the antibody which reacts with the antigen. Tutors, at the www.tutorsglobe.com, take pledge to provide full satisfaction and assurance in Immunology help via online tutoring. Students are getting 100% satisfaction by online tutors across the globe. Here you can get homework help for Immunology, project ideas and tutorials. We provide email based Immunology help. You can join us to ask queries 24x7 with live, experienced and qualified online tutors specialized in Immunology. Through Online Tutoring, you would be able to complete your homework or assignments at your home. Tutors at the TutorsGlobe are committed to provide the best quality online tutoring assistance for Microbiology Homework help and assignment help services. They use their experience, as they have solved thousands of the Biology assignments, which may help you to solve your complex issues of Immunology. TutorsGlobe assure for the best quality compliance to your homework. Compromise with quality is not in our dictionary. If we feel that we are not able to provide the homework help as per the deadline or given instruction by the student, we refund the money of the student without any delay.